what will happen tomorrow? who knows? I think this might be another one of those areas where commercial zeal overpowers any means of actually growing the game. In this case, the 6N grandees love Rome, they want to keep Rome as one of the stellar locations - the old "London - Paris - Rome" line that every brand desires to have. But, consider that there are/were continuing rumours about the Milan clubs wanting to build their own grounds, and vacate San Siro. From what I understand the heartlands of Rugby in Italy are in the surrounding areas of Milan. It would make sense to me for the Italian Rugby people to switch to and make the San Siro their exclusive home. Now, this is said to be happening in Rome too, where the 2 big clubs want their own grounds, so that could open up the prospect of exclusivity at the Olympic stadium. But, it's too big and too far from the groundswell support of the game. Is COS under much pressure in Italy? His record is looking really bad now. I'm grateful for that because unbelievably the Scots couldn't provide a stream of the match. It seems to me that Italy U20 last two years was stronger than this one. Am I right? Yes, the home matches of Scotland U20 seem to be the only games not broadcasted in the whole Six Nations 2019. BigG wrote: It seems to me that Italy U20 last two years was stronger than this one. Am I right? The italian rugby heartland is 200 km east of Milan, in Veneto region near Venice (Treviso, Padova and Rovigo are the main rugby towns). Unfortunately Milan never provided in the last decades an highly performing club; sometime the town has two clubs in the second category (like in this season) but they never show the potential to aspire to Top12. Reading the Italy's starting XV of the 1959 match against Bulgaria (see OLD STUFF thread) you may see that there were twelve players coming from clubs of the centre or of the south of the country, while just three came from northern clubs. 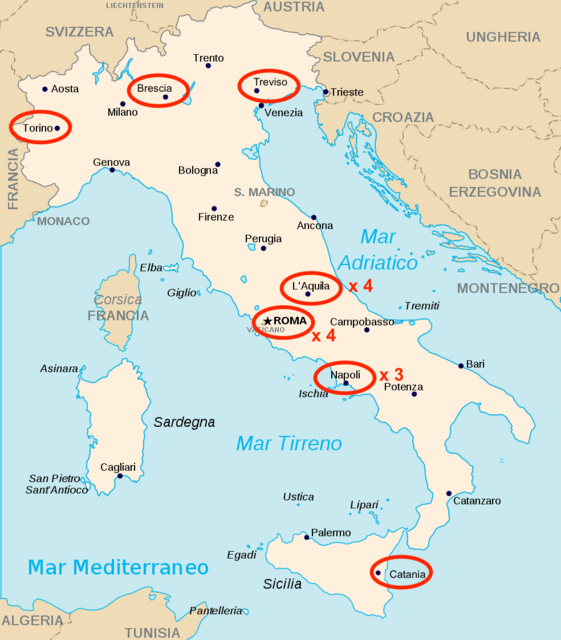 Four were from Rome, four from L'Aquila, three from Napoli, one each from Torino, Brescia, Treviso and Catania. This saturday Parma hosts the final of Coppa Italia, second italian trophy by relevance after the national championship. The tournament is reserved to the clubs not competing in Continental Shield and the final will Valorugby Emilia v Valsugana Padova. Valorugby is the squad of my town. They have several strangers: southafricans Nico Du Plessis (prop) and Armand Du Preez (lock), newzealanders Cardiff Vaega (centre, very powerful even if someway incline to knock-on the ball) and Junior Ngualafe; argentinian Marcos Gatica Schiappapietra (prop), italo/argentinian Luciano Rodriguez (flyhalf), lebanese Karim Jammal (flyhalf, he plays almost never but in the rare chances he had he showed good skills) and italo-brazilian Matteo Dell'Acqua. Valsugana is the second club of Padova (after Petrarca), it's newly promoted in Top12 and it's formed by local amateur players; a very appreciable club with one of the best junior sector in Italy and a women team battling for the national title. Valorugby is firmly favorite for the victory of the Cup. Surely the plan must be to lobby the FFR to get Zebre and Benetton into the Top14, then begin to develop a team from Rome, Lupi. Less travel, less costs, closer links and could create a greater ‘rivalry’ between continental rugby and British rugby. Higgik wrote: Surely the plan must be to lobby the FFR to get Zebre and Benetton into the Top14, then begin to develop a team from Rome, Lupi. Less travel, less costs, closer links and could create a greater ‘rivalry’ between continental rugby and British rugby. That's about as likely as France winning the newt RWC. Good to see Benetton challenging for the playoffs at this stage of the season. Hopefully they'll make the playoffs which would be good for Italian rugby and the league. They should do - all they need now is to beat Zebre. To be fair, Benetton have the easiest schedule in the league by some distance. They play Zebre three times, Kings twice, Dragons twice. Nobody else plays that many games against the three weakest teams. Not their fault of course, thats just the way the system works, but it does give them a boost. Figaro wrote: They should do - all they need now is to beat Zebre. Everyone else in their conference plays Kings twice and Dragons twice. The two additional Zebre games seem like a bonus, but they've got 9 points from the two games so far, so it's only a 3 point or so boost. And they are only 2 points ahead of Llanelli! Thats two extra games against Zebre where e.g. Edinburgh have to play Glasgow twice, or Ulster playing Munster & Connacht. And yes, everyone in conference B gets to play the Kings and Dragons twice, but it's still a boost to have those games against weak teams even if some of your rivals get them too. I mean compare Benetton's schedule with that of Connacht, who get a harder schedule all round with the sole exception of one fewer game against the Scarlets.